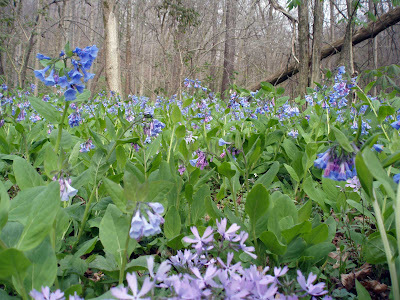 On Saturday, Jojo and I went for a bike ride east of Bloomington, and while hiking in the Yellowwood forest found the motherload of bluebells (Mertensia virginica). Two weeks before we had ridden to Woodall Road where we had found them last year, but no luck, and a lot of hill climbing resulted. But this cool clear spring day we encountered a side valley that eventually rises to Scarce o’ Fat ridge. 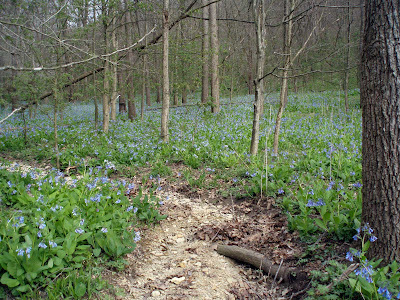 All along the forested valley floor the bluebells were only plants visible, with an occasional buckeye sprout rising above the carpet of blue flowers and magenta buds. There was a dry branch running through the middle, and we walked up it a few hundred yards and sat on a log to admire the etheric glow of the bluebells. Right next to us I discovered a rare plant which did not turn blue once it flowered. 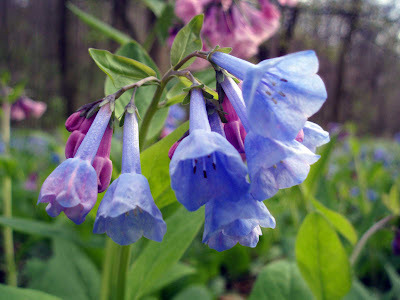 (The bluebell buds are magenta when they appear, then as the flowers grow out of the buds, they morph to the a vibrant deep blue.) 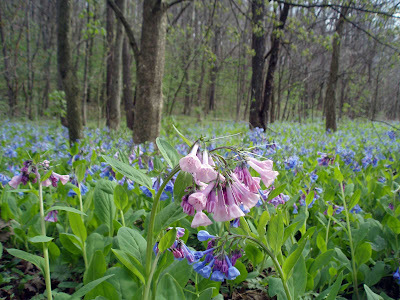 The pink bluebell seemed to be pretty rare, of the tens of thousands of flowers in the valley we saw only 2 pinks, and they were close together. I’ve heard from others that this has been a good year for bluebells, they certainly did like this spring. They are perennials, but also spread from seed that is not easily dispersed. This means that they take over whole areas of a forested flood plain; here they were even beginning to climb the hillside, not their normal habitat.